Hackbright is looking for smart, passionate women who want to make an impact in the technology industry. We’ve noticed that it is a male dominated workplace (how could we not?) and we are committed to changing that ratio by bringing diverse and educated women into the engineering workforce. Do you want to help #changetheratio of women in tech? Begin your journey by applying for our upcoming Software Engineering Fellowship – we are now accepting applications! Apply today or learn more at our next Info Session on April 13th – RSVP here! Hackbright Academy is the premier engineering school for women in San Francisco. The upcoming Software Engineering Fellowship, beginning July 5th, is a 12-week program designed to turn you into a software engineer. If you have been craving that career change (and a salary bump!) now is the time to submit your application! We’re also excited to announce that more students will be admitted this July than ever before. 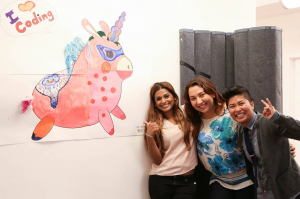 The teacher/student ratio will remain low to keep Hackbright’s signature student experience. Our goal is to provide the opportunity to more women to get software engineering jobs. Hackbright has rolling admissions, so we encourage you to submit your application early to increase your chances of admittance. Come to our Info Session on April 13th. This is a complete overview of the program and we’ll discuss Hackbright’s comprehensive curriculum, unique Career Services program, and the admissions process. You’ll hear directly from Alumnae about their personal experiences, and have an audience Q&A with the whole panel. Since the Info Session is onsite at Hackbright, you’ll get a feel of what it’s like to take classes here. Even if you can’t attend in person, we have a great livestream option. RSVP Here! Cross that application off your to-do list in just one afternoon! Drop by our Application Workshop anytime between 1-5pm on Saturday, April 23rd. You can work on your application, check out the classrooms, meet some staff, and get your questions answered. Hackbright’s team will be there to support you through the process. If you can’t make it in person, we are offering phone appointments! RSVP Here! Read our Frequently Asked Questions – this page is full of helpful information about the program. Don’t forget to also check out our Admissions page, which details everything you need to know about the process. The upcoming Fellowship is from July 5th to September 23rd. The Software Engineering Fellowship is a full-time program that runs Monday thru Friday from 10am – 6pm. Application deadline is May 2nd. Our program centers around mentorship, community, and empowerment. See what our graduates have to say! We are so excited to meet you and #changetheratio together.